In 2012, 86% of those surveyed in France expressed confidence in Obama to do the right thing regarding international affairs; only 14% said they had little or no confidence in him. This was little changed from 2009, when Obama first entered office. But it represented a drastic change from George W. Bush’s ratings in France when he was president. In 2008, only 13% of the French had confidence in Bush to do the right thing regarding global affairs. Nearly nine-in-ten (87%) said they lacked confidence in the U.S. president. 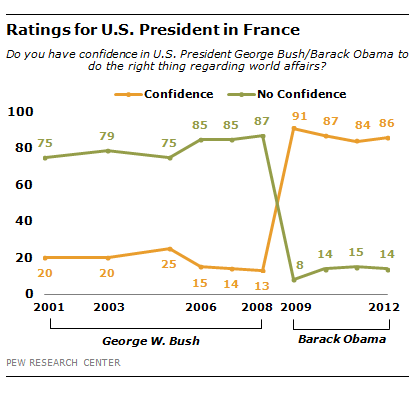 The French showed little confidence in Bush throughout his two terms.